1. Preheat the oven to 200°C, gas mark 6. Place 2 lemon quarters, half the onion wedges, 2 garlic cloves and 2 sprigs of rosemary into the cavity of the chicken. 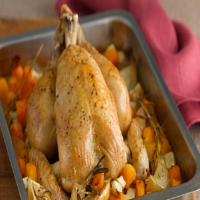 Place the bird in a roasting tin, spray with oil and season the skin with black pepper. 2. Spread the remaining lemon quarters, onion wedges, garlic and rosemary around the chicken. Add the wine and a splash of water. Tightly cover the tray with foil and roast in the oven for 10 minutes. Add the rest of the vegetables to the tray and spray with oil. Re-cover the tray with foil and return to the oven for 20 minutes. 3. Remove the foil and roast the chicken and veg for another 35-40 minutes, until the juices run clear when a skewer is inserted into the thigh. Remove the chicken and cover with foil to rest. Return the vegetables to the oven for another 10 minutes. 4. To serve, thickly slice the chicken and serve with the vegetables. Pour a little of the juice from the roasting tray over each plate. This recipe was first published in December 2012.